The Universe is Our Body! 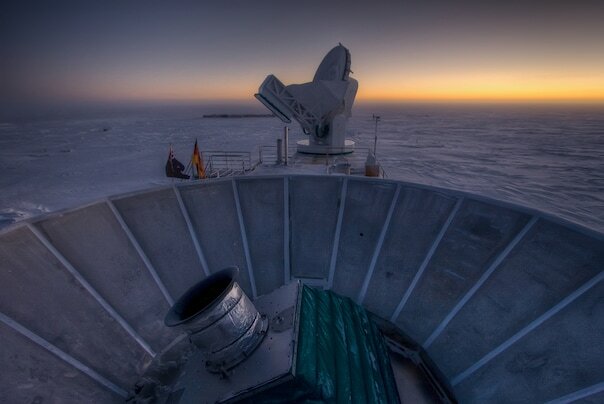 Steffen Richter/Steffen Richter/VagabondPix.co – The sun sets behind BICEP2 (in the foreground) and the South Pole Telescope (in the background). What exciting news! That over 13.8 billion years ago, our Universe, initially infinitely hot and dense, dimensionless, with no space, no time, expanded from microcosmic to cosmically huge in a fraction of a second. ‘Cosmic inflation’ throws gas on the ‘big bang theory’ say cosmologists. “The inflationary model implies that our universe is exceedingly larger than what we currently observe, which is humbling already in its scale,” says Princeton University astro-physicist David Spergel. Reading this wonderful article immediately after my morning meditation and words from Thich Nhat Hanh in Love Letter to the Earth, I am amazed and happy to be alive, to be part of such a vast, powerful, ancient and beautiful Universe. Why be afraid? We are as old as the energy and gravity that burst into stars and planets billions of years ago. We are as fresh and new as the snow on the ground this morning. Our lifespan is as limitless as that of the Universe. In touching the snowflake or my own hand, I touch the energy and life that began in the earth and in my body billions of years ago and will continue in new forms for billions of years to come. How freeing! This is the premise of an idea called cosmic inflation — a powerful twist on the big-bang theory — and Monday it received a major boost from an experiment at the South Pole called BICEP2. Visited you in your suburban MD home several years ago; not surprisingly, you didn’t remember me from The Old Days (sparse but memorable-to-me contacts from 1969 to 1971, when I went to prison as a war resister and we lost touch) but you were gracious enough to sit and reminisce with me about some friends we had in common back then, and about experiences, some common, some un-. Excellent to see you still “at it”. I guess I’m still “at it” too, if going through the motions counts, though I gather from your blog that you’re still possessed of a lot more optimism than I am. There is much good in my life, notably my wife of ~40 years, who has for all this time been more than I ever could have deserved or even hoped for, and our two now-adult daughters. But we’re all surrounded by a world that leaves me much less optimistic/hopeful than I used to be. Sorry it has taken me so long to reply….my blog is “stuck” and won’t “publish” right now, so I haven’t been on it much. Great to hear from you! If you send an email address, we can communicate more privately. I’d love to hear more about your life. Mine is AWESOME! So many blessings and great friends and family.